First of all, if you’re so desperate that you can’t function anymore, you haven’t gotten any sleep in months, and you feel like you’re a shell of your former self, consider hiring a sleep consultant. I know. It sounds extreme. And you may be thinking, Oh, babies have been sleeping since the beginning of time. Why should I pay an expert? If you’re still thinking that, you may not be desperate enough and skip down to the books and other resources. If you are that desperate, it’s not as expensive as it sounds. Just do it. Seriously. I’m not getting paid for this. The Baby Sleep Site: Nicole Johnson, who started the site, has a variety of packages for basically every budget. I paid for a personalized sleep plan when our son was about five months old (and not sleeping for more than an hour or two at a time). Then I consulted with them again when he was a little over a year old and he decided that not only was he not going to take two naps anymore, he simply wasn’t going to nap at all. And then be miserable and tired all day. No matter what your beliefs about sleep, cry it out, attachment parenting, Nicole and her sleep consultants will help you. And give you a step-by-step plan for following through, as well as e-mail support. Sleeping Through The Night: How Infants, Toddlers, and Their Parents Can Get a Good Night’s Sleep by clinical psychologist Jodi Mindell. She has a readable, easy style and doesn’t overwhelm you with data. Very practical. She respects any level of crying with which you’re comfortable. You’ve heard of Ferber? This book is basically “Ferber” for absolute wimps. She also has an advice column on the Parents Magazine website. Healthy Sleep Habits, Happy Child by Marc Weissbluth. This is the book — in my experience — that you’re likely to get passed to you on the playground by another mom if you start looking like a zombie and start rambling about how you will never sleep again. To me, while I completely respect the book and it has tremendous information, this is a shame. This is a book that is best read before your baby is born, or if you’re having a second child and you want to have a better sleeper this time, or once things have evened out a bit and you want to understand children’s sleep better. In my humble opinion, this is not the book to turn to at 2 a.m. by the light of your iPhone. It’s not terribly well-edited, it’s dense, and full of great research but too overwhelming for a sleep-deprived parent. Still, definitely get it as a resource. 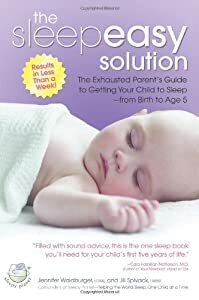 The Sleepeasy Solution: The Exhausted Parent’s Guide To Getting Your Child From Birth To Age Five by Jennifer Waldburger. This is the other book that I highly recommend, besides Mindell’s. What I like about this one is its focus on development and more discussion of older babies, toddlers, and preschoolers. She describes how sleep — in a very practical way — fits into the big picture of how your kid is growing and developing. Easy to use, implement, and very sympathetic. Which book or resource did you find indispensable to help you cope with your child’s sleep problems or to understand sleep? What to do when your toddler won’t go to sleep? Talk amongst yourselves.